The division can also be interpreted in terms of? territory to help explain the current situation. 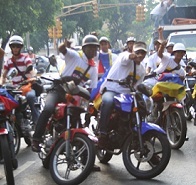 The opposition won the states of Zulia, Táchira, and Mérida, among others. This is the region bordering Colombia, where protests helped carve out a “liberated zone” during the month of February, as in the capital of Táchira, San Cristóbal. There, the public university was set on fire by protesters with (at least) the complicity of state and municipal authorities linked to the opposition. Two facts seem evident: government repression resulted in the death of several protesters, and both the opposition and pro-Chavez groups use firearms. Journalist Aram Aharoninan, former director of Telesur, says that of the 40 deaths between Feb. 12 and late March, 22 were “targeted killings of pro-government supporters, carried out ? 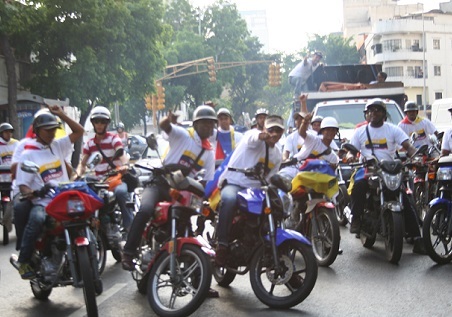 ?by Colombian paramilitary forces allied with the Venezuelan bourgeoisie” (Rebelion, April 1, 2014). The Attorney General’s Office released data when the death toll reached 31, disclosing that 143 policemen were among the 461 injured in the demonstrations. Several uniformed officers were killed. Of the nearly 2,000 detentions, only 168 remain behind bars, according to the government. As early as 1936, one of the most highly regarded Latin American intellectuals, Arturo Uslar Pietri, published an article that made ??history. It was called “Sowing the Oil.” He pointed out two key facts: the oil industry would have an ephemeral character, and also a destructive one. In the first aspect, he seems to have erred. The second hit home like few others.